A few members so far including Me, Dan and Pringers have all started a Premiership game as different teams. Me - Sunderland, Dan - Villa and Pringers - Birmingham are all going to use this thread to post updates on our games such as transfers and results. If you want to take part just say and you can use this thread to. If you want to join maybe try going as a different team to us and we could try to get a full premiership league. Not content with the squad I decided on another GK, I just couldn't bear the thought of actually having to play Scott Carson in goal. I have accomplished two goals with this win, first is to get WBA into Europe, the second was to win the League Cup for the very first time in FM. Still 7th in the League and in the FA Cup. I probably wont get much higher in the League as I am a fair few points behind the top teams, but a few slip ups by Man City and I could go 6th. I hope you can build on a fantastic season at the Baggies! 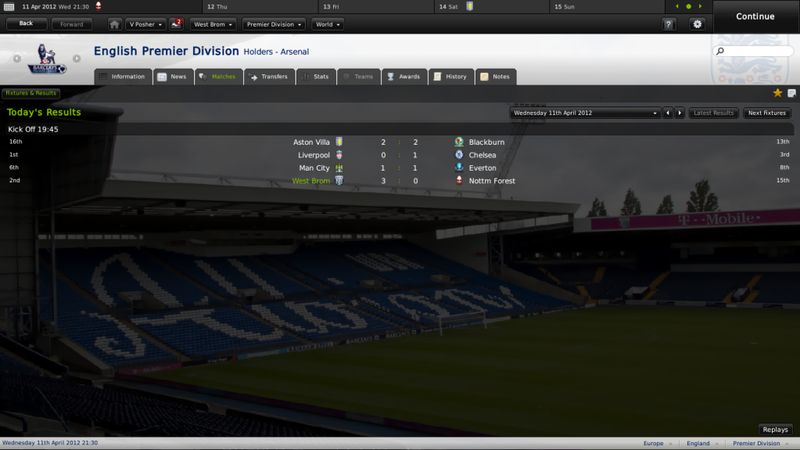 Well the season is over, couldn't quite catch Man City and lost to them 0-1 in WBA's last home game of the season. 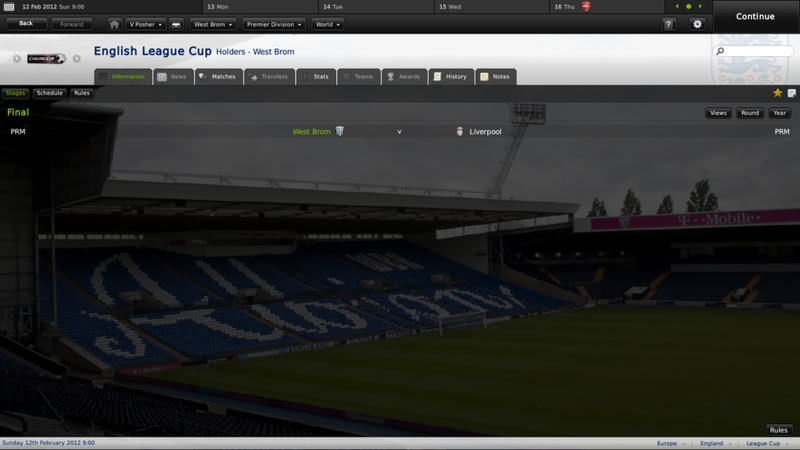 And the Baggies march into Europe by way of the League Cup win and also a 7th place finish. A brilliant second half to the season where the team really played well together, playing with a rotation of lone strikers. Ismael Miller, Macheda & Kherzakov. Santa Cruz's loan ended in January and he returned to Man City and then was sold to Man U.
I have been unable to purchase Macheda from Man U so I may have to look for a new striker for next season. 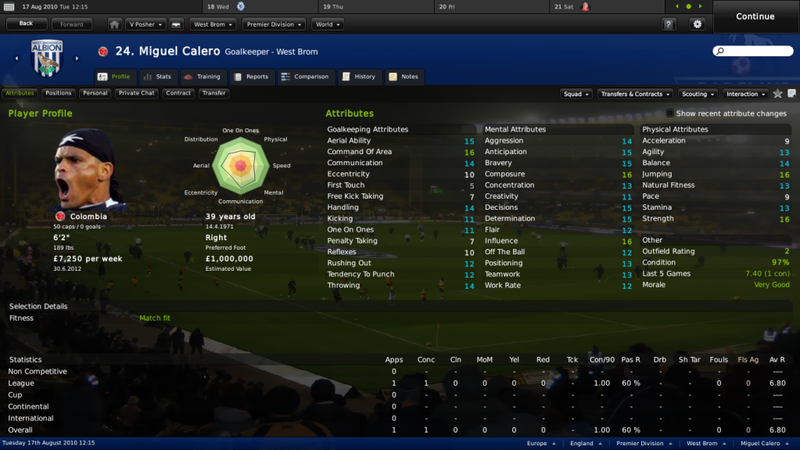 Calero played an amazing season in Goal, would highly recommend him for any EPL team even though he turned 40 during the season. Rodrigo Brana stepped right into the "Maschereno" role for WBA and that really made the difference in the second half of the season. Park Ji-Sung had a good season but wants to leave so I will let him go. Both of my DC's are a little on the slow side, Radoi and Olsson so I may be in the market for a speedy DC. It won't be a clear out of the squad by any means but will have to kick it up a notch for Europe. Great season there Posh, congratulations on the Carling Cup win, and the great league finish. Shame to hear about Santa Cruz, and Macheda but I'm sure you could attract some great players in the transfer window. Hope you can sort out the issues with your squad and that money from the Europa League won't do any harm either! I am still wheeling and dealing in the Transfer Market. I am still needing a Striker as Man U won't let Macheda leave and Miller is out for at least 4 more months with a broken leg. I will probably have to go with an HG striker to keep mu numbers good so any suggestions are welcome. Some nice signings there Posh, especially Sirigu from Palermo . Hmmm...I'll have to have a think regarding the striker, as any names have escaped me at the moment. have you checked the freebees? i know Dzeko goes after the first season haha ambitious but you never know lol. How much money have you got to spend? 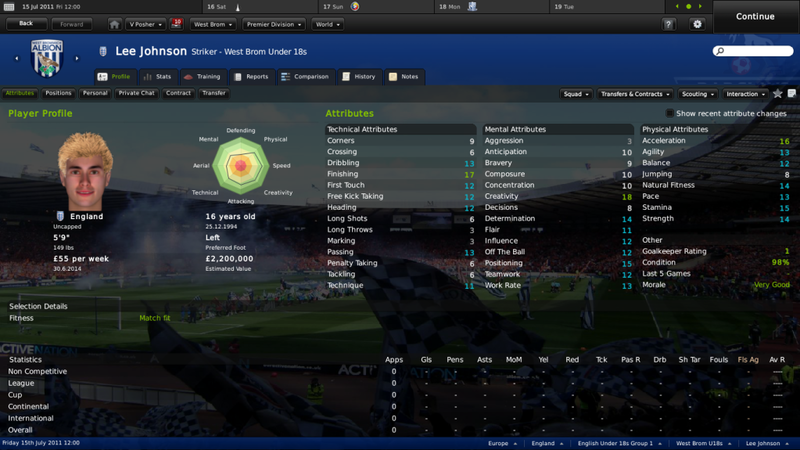 Not much in the Freebies, except for Crespo, he may be a good backup choice for a season though. Dzeko is at Wolfsburg until 2013. I have 10.5M left in the kitty to spend. And, make sure you look at who's on the transfer list and on the loan list, have picked up some amazing bargains on there! Need a little more top notch than them mate, but thanks. 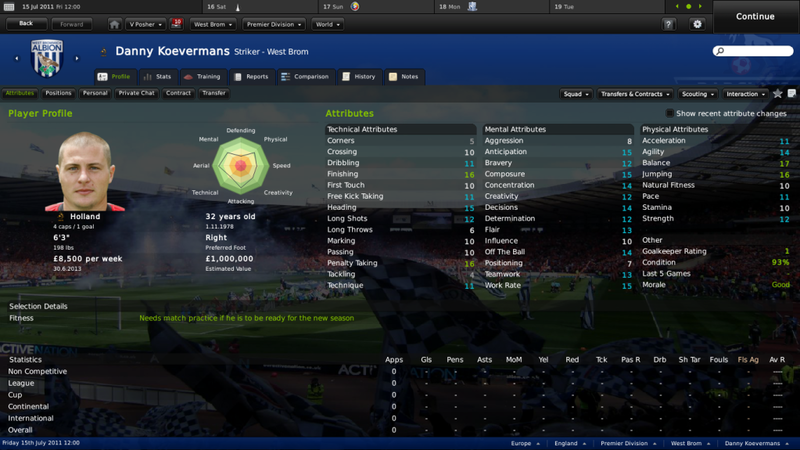 Danny Koevermans, he was on a freebie and still has some great attributes. His salary requirement was perfect too. I noticed that Maurice Edu was unhappy and available at Rangers so I took advantage of that, his salary is at the top end of my players but I think he will be worth it as he is still young. 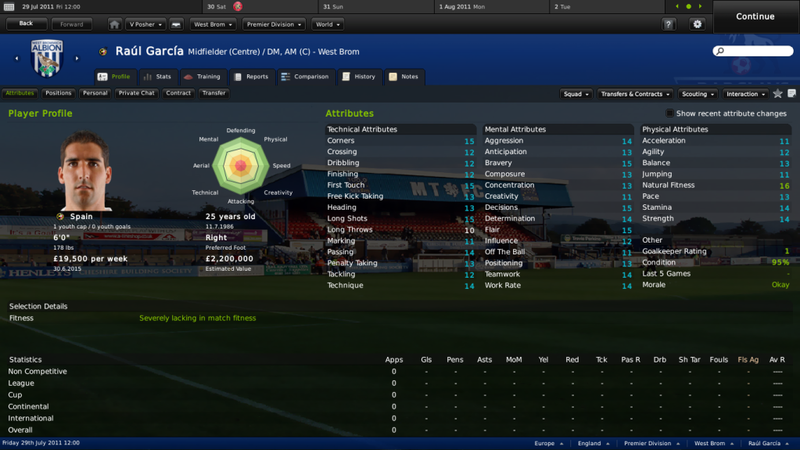 Then after all that Man U finally let Macheda out on loan again so I have him back on a season long loan. Great way to finish off the transfer window Posh Really good signings and hopefully they'll work wonders in Europe and of course in the league. It's amazing that in your 2nd season you're trying to improve on 7th place! Good luck mate and I'm sure you'll do really well once again! Oh, and nice work wrenching Macheda away from United. Some great signings there, Posh. Keep up the excellent work, and let's get the Baggies climbing the table! 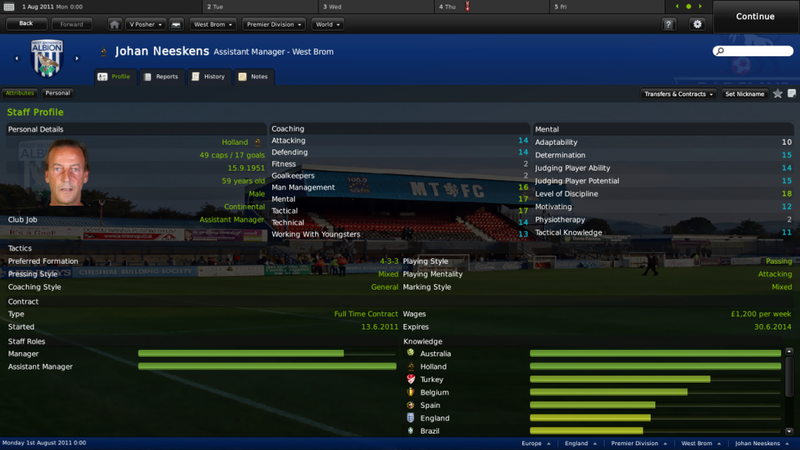 After asking the board for more coaches I re-evaluated the staff and decided that I need a new Assistant Manager and just couldn't pass up Neeskens. 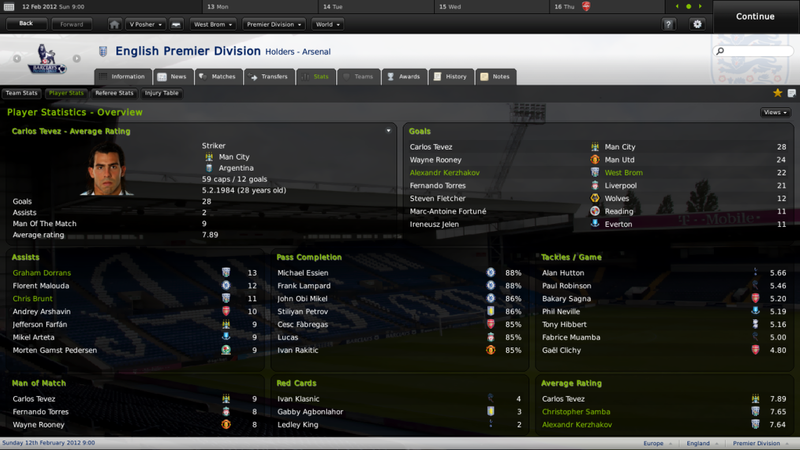 Now everybody has been offering me players, I could have had most of Man City's team if I could afford the salaries. But an interesting one was offered and I took it. First leg in Europe was a very nice 3-0 win away at Celik so the home game should be comfortable for the players and maybe I will experiment a little with the formation. Well i started one as West Ham and after a very good 1st season signing Macheda (Loan), Delvin Ndinga (£3.4Mil), Boussoufa (£6Mill) in finished in a great 8th. I also won the carling cup meaning Europa League next season. Because of this i felt i needed to improve the team and after being given a budget of around £30Million i went on a spending spree. Wow, some great signings there Tom. Keep up the good work. i was thinking that bit i realised i have only payed 3Million atm and i have just loaned him out and i might next season then i can play 49 games so like a season and a half with him and if he plays bad i can sell and maybe get a profit and if plays well in the games keep him and pay the extra 3 mil. He's currently at Braga on mine, and I'm in 2017. I Am now in the 3rd season. 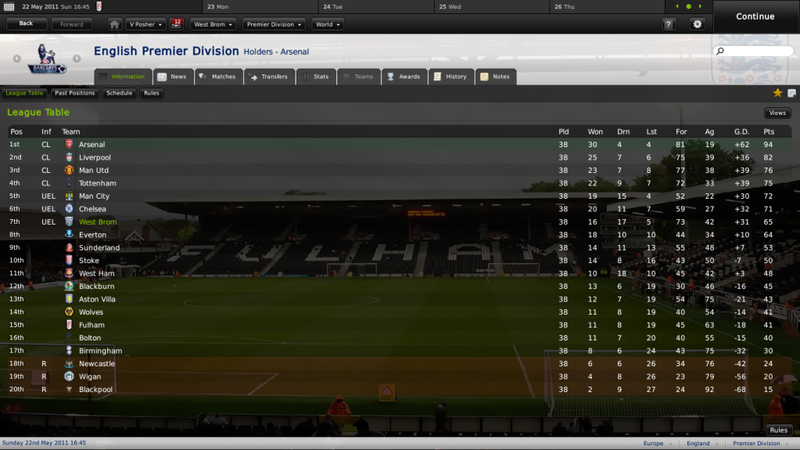 Last year i finished 2nd in the league. Knockedt out of carling cup by Arsenal in Quaters. Won the FA Cup and lost to Braga in Europa. I needed to improve again as i was in the Champions League Group Stages. Some great signings there Tommo, keep up the awesome work, and a league title may be beckoning the mighty Hammers. We find WBA at the top of the league and have become the team to beat but the Baggies are knocking in goals from everywhere. Kherzakov is truly magnificent in the lone striker role. Knocking in 22 league goals so far. And in the final of the League Cup again. Looking like an amazing season for the Baggies !! You pick an English Premier League team to manage, tell us who your going to manage then update your game in this thread letting us know about any transfers, results or if you have decided to move on from the club to another. 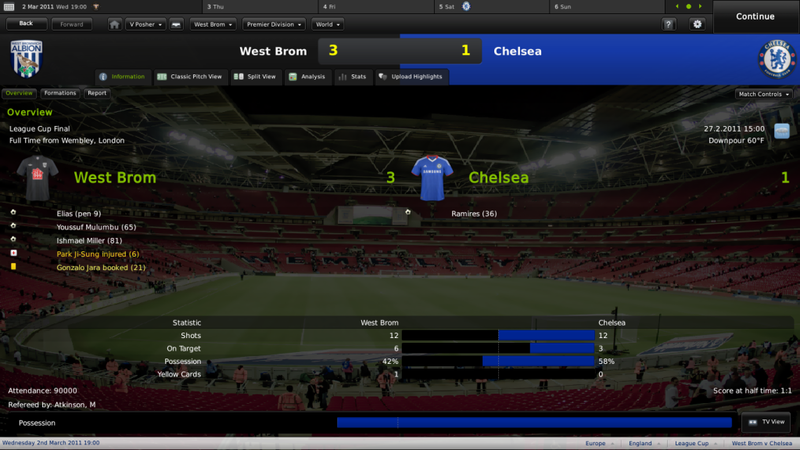 West Brom retain the League Cup and ensure that they will be in Europe again next season. Actually this was a more exciting game than the scoreline suggests. Lots of penalty calls that were dismissed by Mr Webb the ref. I played 4-1-4-1 Counter in this one and it paid off. Wow, great result mate, another season in Europe too. Really cracking stuff, well done . 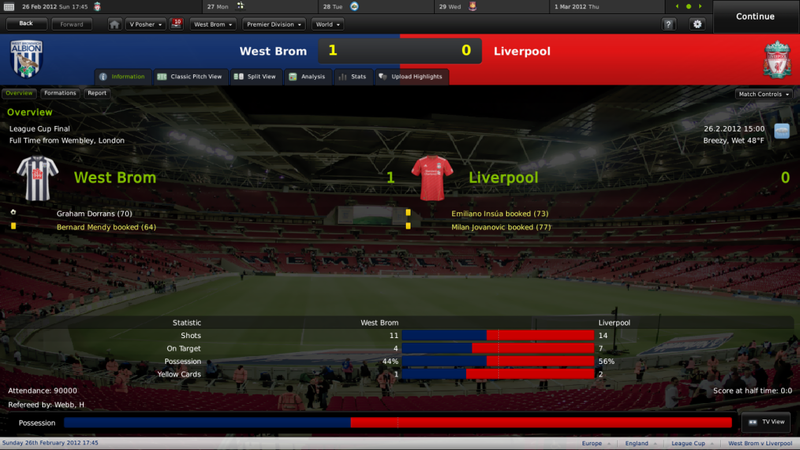 Winding down the season and Liverpool finally slip up, at home to Chelsea losing 1-0. Surely I am in with a chance now? The Liverpool V West Brom game could be the clincher for the title. 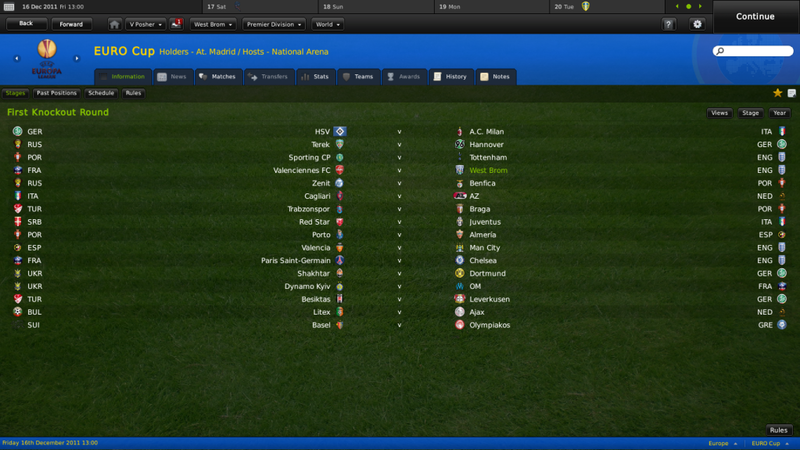 On the European front, The Baggies put up a good fight but couldn't overcome Porto and went out in the Quarter Finals. Still on for a treble though, having already won the League Cup and still in the FA Cup with a great chance of winning it considering the teams left in. 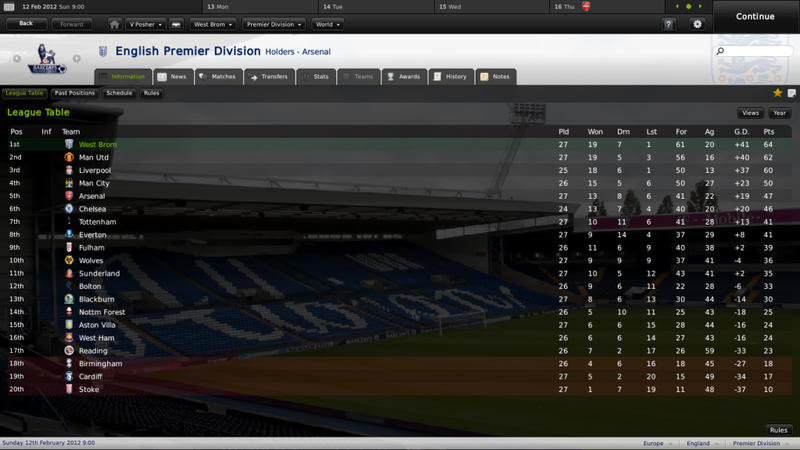 This could be the most exciting season in West Brom's history !!! Amazing work here Posh. You've done a really impressive job at West Brom, you've turned them from newcomers to title challengers to two seasons! Really great stuff.